Windows 10 includes some flashy new features like Task View virtual desktops, Cortana, the Edge browser, a Start menu, and apps that run in windows. Here are some of the other, more overlooked improvements. If you’re upgrading from Windows 7, you’ll also discover many of the improvements from Windows 8 . This includes everything from the new file copy dialog and Task Manager with a startup manager to improved security. Windows has offered a built-in way to print a document to a file since Windows Vista. However, Microsoft has been obsessed with pushing their own XPS format. 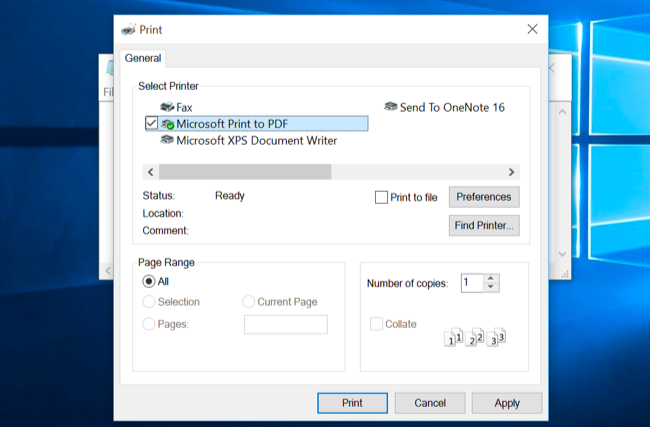 But, with Windows 10, you’ll find a “Microsoft Print to PDF” printer installed. Print to it to print a document to PDF from anywhere in Windows, all without installing third-party software. Windows 10 includes a “Game DVR” feature along with a “Game Bar” for activating it. Settings for this are available in the Xbox app, and it’s intended to capture videos of PC games while you play them. OneDrive has changed a lot from Windows 8.1. Microsoft dumped Windows 8.1’s OneDrive system and its placeholder files and restored the OneDrive client found in Windows 7. This means the “fetch files” feature is back. 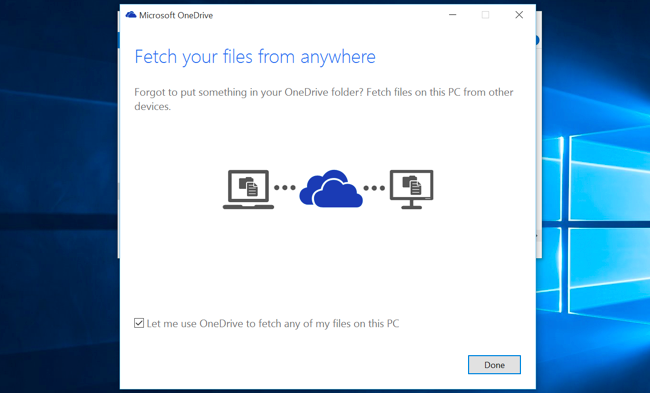 Enable it and you can use the OneDrive website to “fetch a file” from anywhere on a connected Windows PC, as long as it’s powered on. If your PC is running and you want to access a file you didn’t add to your OneDrive, this can do it for you. Microsoft added a delay function to the Snipping Tool, the built-in screenshot tool on Windows. This allows you to start a timer and have the screenshot taken one to five seconds later. Previously, this required third-party screenshot utilities. Windows 10 also retains the built-in screenshot hotkey added in Windows 8. Press Windows Key + Print Screen to take a screenshot and save it to your user account’s Pictures\Screenshots folder. The Command Prompt gained a number of useful features in Windows 10, including support for keyboard shortcuts like Ctrl+V to paste. In the final version of Windows 10, these Command Prompt improvements are activated by default. Everyone was talking about the Command Prompt improvements at one point, but they’ve been overshadowed by Cortana, Task View, and other whizz-bang new features since then. 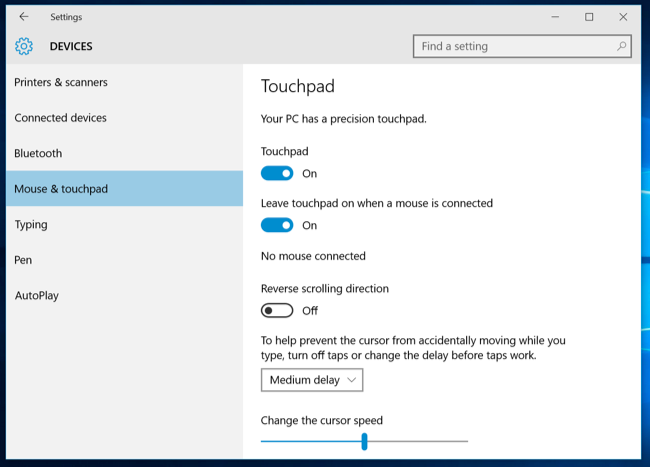 Many more settings for laptop touchpads can now be controlled in the built-in Settings app under Devices > Mouse and touchpad. Previously, these features were only accessible and configurable in manufacturer-specific touchpad configuration tools. Options like palm rejection, what three finger actions do, and disabling the touchpad when a mouse is connected are all found here. Microsoft began adding support for these options in Windows 8, but Windows 10’s options look more fleshed-out and comprehensive. 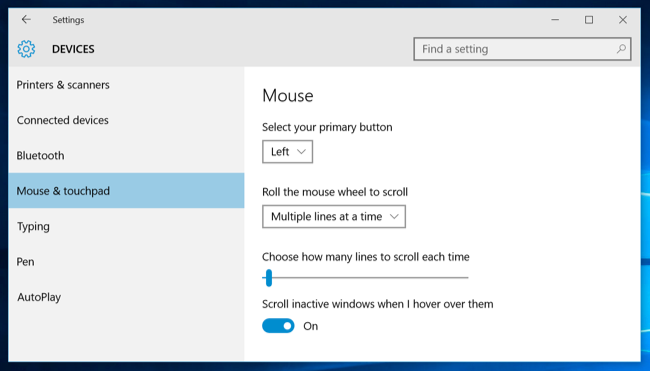 Windows 10 adds a “Scroll inactive windows when I hover over them” option that enables scrolling in background apps, and it’s on by default. This allows you to move your mouse cursor over an application in the background — even if it’s not focused — and scroll with the mouse wheel or your touchpad. The cursor will scroll whatever it’s hovering over. Mac OS X has this feature enabled by default, too. 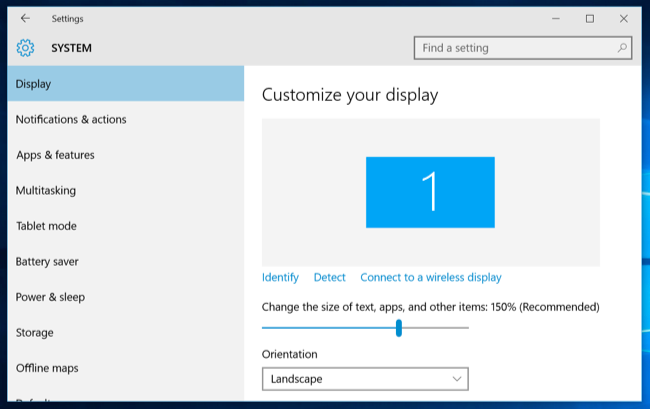 Windows 10 improves display scaling from Windows 8.1. Now, you can set an independent DPI scaling level for each connected display. So, if you have a high-resolution device such as a Microsoft Surface and a lower-resolution external monitor, you can give each display its own DPI scaling level so everything looks correct. Previously, all connected displays shared a DPI scaling setting. To do this, visit the Settings app, select System, and select Displays. If you have multiple displays connected, you can set a different level for each of them. This interface only lets you select a level in 25 percent increments. If you need more configurability, select “Advanced display settings” here, select “Advanced sizing of text and other items,” and click the “Set a custom scaling level” link in the old Control Panel to set a more precise scaling level. Windows 10 isn’t an iPad-style locked-down system anymore. Yes, the Windows Store is still there, and it’s normally the only source of those new-style “universal” apps. But you can enable app sideloading with a quick click in the Settings app. After you do, you can install universal apps from outside the app store. As on Windows 8, you can get traditional desktop apps from anywhere without enabling sideloading. 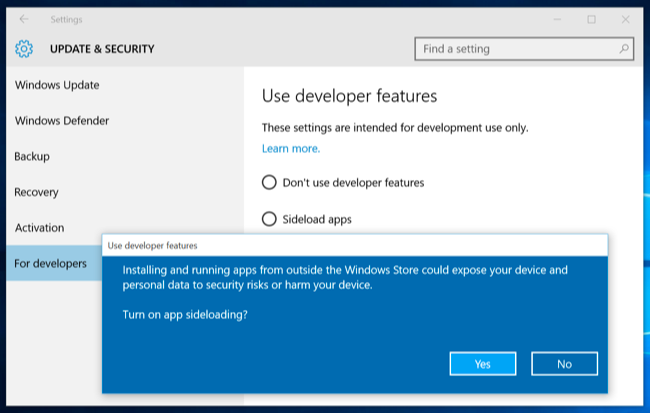 This isn’t just a perk for users looking to install unapproved apps — it means businesses can sideload line-of-business apps on their own devices without an obnoxious setup process. They can even sideload apps onto any Windows 10 device, whereas this previously required Windows 8 Professional, a domain-joined PC, and a “sideloading product key” only available through volume-licensing contracts. File Explorer has received a bit over an overhaul. It now defaults to a “Quick Access” view that shows you your frequently accessed folders and recently accessed files. The “Quick Access” view in the sidebar offers quick access to frequently used folders from wherever you are. This is clearly designed to help less-experienced users find their important files faster, eliminating the frustration of digging through the file system. 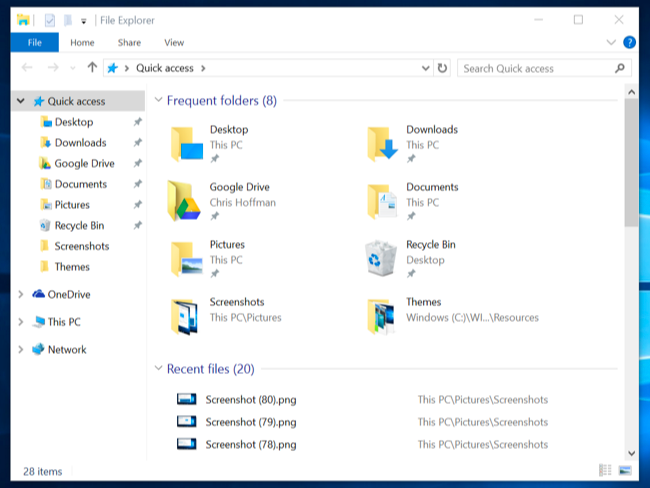 If you don’t like this change, you can disable the Quick Access view and make File Explorer open to This PC. Some other changes are less obvious. For example, Windows 10 doesn’t enable System Restore by default. This saves space on your device storage that would otherwise by used by restore points. In theory, Windows 10’s Reset functionality and tools like the SFC and DISM commands can help get Windows 10 back to a working state if it ever becomes corrupted. But System Restore is still part of Windows, and you can enable it yourself from the Control Panel if you’d like to have it as a safety net.